talk you through step by step instructions on how to start with your robin’s body and then build upon this to add the wings, tail and face. I will be on hand to guide you through the process so you don’t need to have any experience of needle felting before hand. 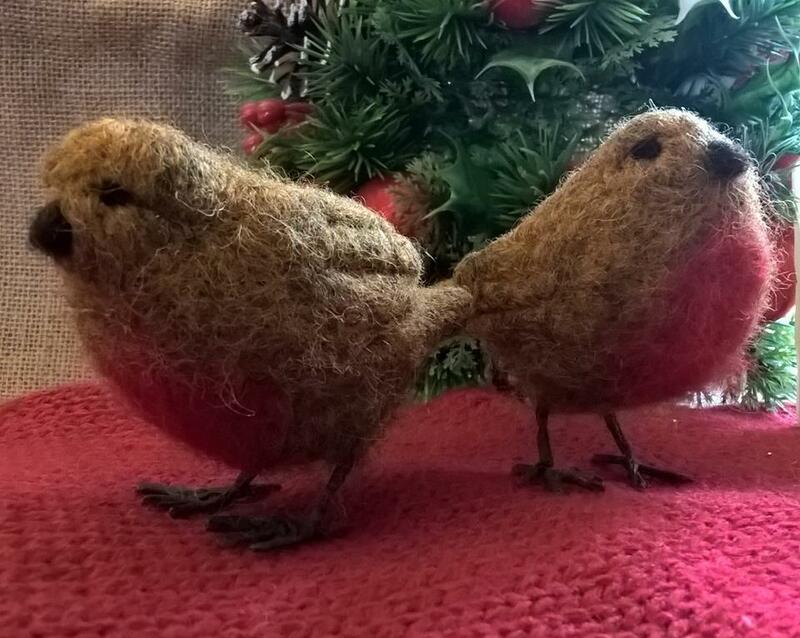 Your robin will have wire feet so you will be able to gently attach him to your Christmas tree. I can show you how to make these time permitting but will have some ready made ones prepared. We will finish him off by adding a little beak and eyes that you can add to complete the finished piece. Refreshments and mince pies will be provided as will all of the materials. If you have any questions please PM me on facebook messenger. Please note we will be using sharp barbed needle felting needles so care must be taken not to stab your fingers! I will explain and show you how to safely use the needles. Older children are welcome, my 11 year old son made several birds with my supervision, however I cannot take responsibility for your child. Your child’s safety is your responsibility and your discretion as to whether they can use the needles safely.